After five people were killed in Saptari last Monday, Madheshi Morcha has been especially aggressive toward CPN-UML. It also withdrew its support to the Maoist-Congress coalition government after it failed to amend the constitution and postpone local level election. Is it the case that its protests are directed more at UML than the government? Why does the Morcha blame UML for the Saptari killings? What kind of protests is Morcha planning? Jitendra Sonal, General Secretary of Tarai-Madhesh Democratic Party, a key constituent of Madheshi Morcha, talked to Mahabir Paudyal on Wednesday morning. Of late Madheshi Morcha’s protests seem directed more against CPN-UML than government. Why? That is not the right reading of our protests. Our protests are more against the government than UML. We are aware that a certain party cannot address our demands. Since UML is a major party in national parliament, what it says and does affects constitution amendment process. But our main issue is with government and parliament. This is why we issued the seven-day ultimatum to the government after Saptari incident. We wanted the government to finalize constitution amendment and postpone local election. When the government failed to do so, we withdrew our support. We had clearly stated in our five-point memorandum that our support to the government will end in seven days if the government failed to address our five-point demand. Since the government failed in this our support has also been automatically withdrawn. But after the Saptari incident, the Morcha seems to be placing all the blame on UML. Like I said, our issue is mainly with the parliament because the amendment bill won’t pass without two-thirds majority. UML got dragged into this because it had stood against amendment from the start. It has been saying that it won’t allow the amendment bill to be discussed in the parliament, while the government, which we supported, appeared keen on amending the constitution. UML demonstrated its undemocratic character by blocking the amendment process. This made Madheshi people feel UML is against addressing their genuine grievances. So they got agitated. How could Madheshi people welcome the force that had stood against amendment? UML riled Madheshi people in two ways. First, they seemed to be saying that since we command nearly one-third majority in parliament, we won’t even allow discussion of the amendment bill, let alone let it pass. Second, it seemed to say to Madheshi people that since we are powerful in parliament we also have the right to come to your doorstep and speak against you. Madheshi people are no fools. So they said to UML in no uncertain terms that since you are against constitution amendment you have no right to come to Madhesh to taunt and insult us. They thus prohibited UML’s entry into Madhesh. This resulted in the Saprati tragedy. All this might have created the impression that Madhesh protests are essentially against UML. But in reality it is a battle between those who favor constitution amendment and those opposed to it. In other words, this is the conflict between status quoist and progressive forces. You single out UML. But even RPP and a considerable number of Nepali Congress leaders are against the amendment. It would not be right to read too much into what individual leaders of certain parties have to say. Congress and government leadership has not backed down from their stand on amendment. They tabled the amendment bill in parliament and have put it up for discussion. Likewise, there are moderate voices in UML who say Madhesh problems must be resolved. But those voices have been sidelined as UML leadership has stood firmly against amendment. UML leaders claim they conducted ‘Mechi Mahakali Campaign’ after consulting top Morcha leaders. Why didn’t Morcha leaders ask their cadres not to disrupt UML rally? Madheshi forces, Nepali Congress, UML and Maoist party fought together for democracy, republic and federalism. We were together until the time of promulgation of Interim Constitution. This cooperation among was broken after three major parties forged the 16-point agreement by bypassing Madheshi forces in June, 2015. This created conflict between Madheshi forces and three major parties. Even today, there is no alternative to four major stakeholders of constitution and political process working together. Rift between UML and Madheshi Morcha widened after UML leadership started issuing insulting and derogatory statements regarding Madheshis. When Madheshis united to form human chain from Mechi to Mahakali, UML chief called it makhe sanglo. When Madheshi people were killed by security forces, he compared the dead with ‘few rotten mangoes’ and said they did not matter to the country. UML did not stop there. It was dead against letting amendment bill enter parliament. So we visited Madheshi villages and told Madheshis this is what UML has been saying and doing to Madheshis. If you think this is right, welcome UML with red carpet, if not, peacefully protest UML’s entry in Madhesh. Madheshi people came out to protest UML rally spontaneously and even sacrificed their lives. We only informed Madheshi people about UML’s opposition to our demands. This is the reality. Madheshi Morcha has not directed Madheshi people to retaliate against UML. Even after five people were killed in Saptari tragedy, top Morcha leaders have not appealed to the cadres for restraint. Clashes between Morcha and UML cadres are reported from several districts. Is it because Morcha leaders have no control over their cadres? Derogatory and insulting remarks against Madheshi people from UML top leaders even after Saptari tragedy has angered Madheshi people even more. This has turned whole Madheshi population against UML. How can a leader like Bamdev Gautam dishonor mothers of Madheshi leaders? In Bhairahawa he questioned nationality of mothers of Madheshi leaders. How can you expect Madheshis to take this insult so easily? What can be more insulting to Madheshis than this? So protests against UML in Tarai plains are the expression of anger against UML leaders’ tendency to insult Madheshis. But let me clarify, we have not instructed our cadres to bar UML from entering Madhesh. If UML were a democratic and responsible party, it should have cancelled its ‘Mechi-Mahakali’ campaign after Saptari incident. It should have immediately held talks with Madheshi Morcha. Instead, it is further angering Madheshis. As for relation between Madheshi people and Madheshi parties, the bond between them has gotten stronger. They protested because they saw how UML opposed the bill which Madheshi forces want passed. This is proof of strong bond between Madheshi Morcha and Madheshi people. The current amendment proposal which proposes to hive off hill districts from Province 5 has been met with opposition in that province. Yet Morcha has not budged from its earlier stand on Madhesh-only provinces. We have valid reasons for demanding ‘Tarai-only’ provinces. I don’t understand why UML and some Congress leaders are against this. I sometimes doubt their commitment to federalism and republicanism for which we fought together. What we are asking for is what Congress and UML had agreed to in the past. The report of the State Restructuring Committee of first Constituent Assembly, which was brought out after intense deliberations among Madheshi forces, Congress, UML and Maoist party, had proposed two provinces in Tarai. The State Restructuring Commission had also proposed two provinces in Madhesh. The seven-province model floated by Congress and UML had also recommended two provinces in Madhesh. At the time of constitution promulgation, top leaders of three major parties had promised to address our demands through amendment. They had all accepted that the constitution is imperfect and it needs to be further improved through amendment. This is in record. Now they have suddenly made a volte face and started advocating for provinces incorporating both hills and plains. You talked about anti-amendment protests in Province 5. If you take it as the will of the people what do so you say to the protest for ‘Madhesh-only’ provinces that took place in Tikapur and other places in 2015? You have to look at whether such protests are spontaneous or politically motivated. Protests in Tikapur and other places were spontaneous. The one in Butwal was sponsored and politically motivated. You need to draw a fine line between the two. If we make past proposals on province demarcation the main basis for negotiation, we can still reach an amicable solution. We can review those proposals to see what can be done to amicably resolve the problem. For example, we can accommodate certain Madheshi and Tharu dominated areas of Tarai districts in Tarai provinces. There are ways to settle this issue. But we have not discussed those alternatives. UML and Morcha leaders had reportedly resumed dialogues a fortnight ago. What led to the new deadlock? Yes, there were some rounds of talks between second-rung leaders of UML and Madheshi Morcha. When you are sitting for meaningful dialogues both sides need to start with open minds. But UML comes with the precondition of not altering provincial boundaries at such talks. When you put up certain issues as non-negotiable, how can there be meaningful talks? This is the reason those talks did not continue. We are still open for talks with UML and with ruling parties. But there can be no meaningful result if we start with ‘my way or the highway’ attitude. Why is Madheshi Morcha firmly against local level election which has nothing to do with province demarcation? It sometimes feels like Nepali media do not report on our issues holistically. They only highlight parts of what we say. We have not said local election must not be held or federal election should take place first. Our stand is none of the elections, be it for local level, provincial assembly or for federal parliament, should be held under the status quo. That is, unless the constitution is amended we will oppose all three elections. We will try to foil them through all means. But if we can reach even minimal consensus on constitution amendment, then we should first go for parliamentary election. We are against holding local elections first because this is against the principle of federalism. In federal dispensation, local elections are held by respective provinces they are under. This is the practice in every federal country in the world. Local election is no business of central government. It is under the jurisdiction of provincial government. They are trying to go about it the wrong way here. This makes us suspect a ploy to dilute the agenda of federalism. Besides, Madhesh accounts for 51 percent of Nepal’s total population but the Local Level Restructuring Commission (LLRC) has not allocated local level units based on this population pattern. 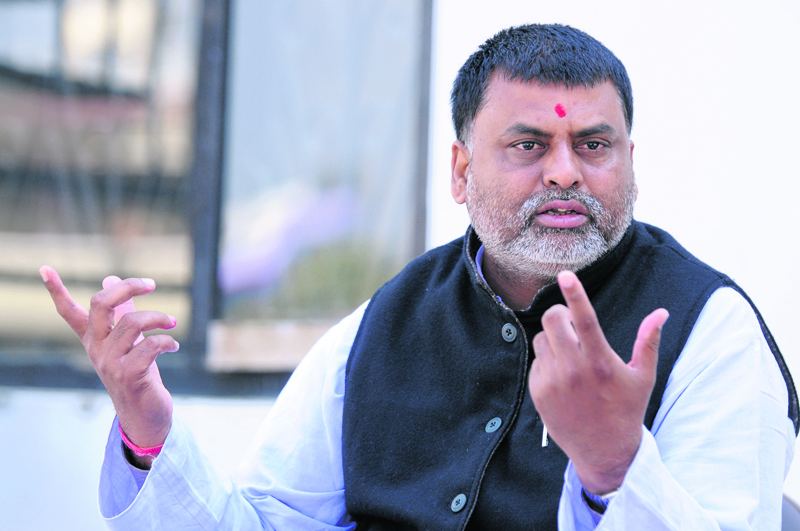 It has only allocated around 30 percent units for Madhesh. How can we accept this? This is another reason we are against local election under this set up. We need to elect a new parliament under federal system by January, 2018 so as to avoid a political and constitutional crisis. How can local election serve this purpose? Why don’t leaders of major parties understand this? Finally what kind of protests have the Morcha planned for the future? We will continue with peaceful protests. But I have something to say to Nepali media as well. When Madheshi people are killed by state forces, when our cadres are attacked and our programs are disrupted, nobody speaks for us. When Madheshi people are suppressed with brute force, they stay silent. We have been projected as anti-constitutional and anti-national force. This really hurts us. We all are fighting for equality, justice and inclusive constitution. I call on everyone to support our cause.